Due to the fact that the Experiment Acceptance Review (EAR) of Suaineadh on the 7th of November is getting closer, the Suaineadh team is spending a lot of time in the workshop and lab t hese days. During the last couple of days the 915MHz antennas have been manufactured at KTH. 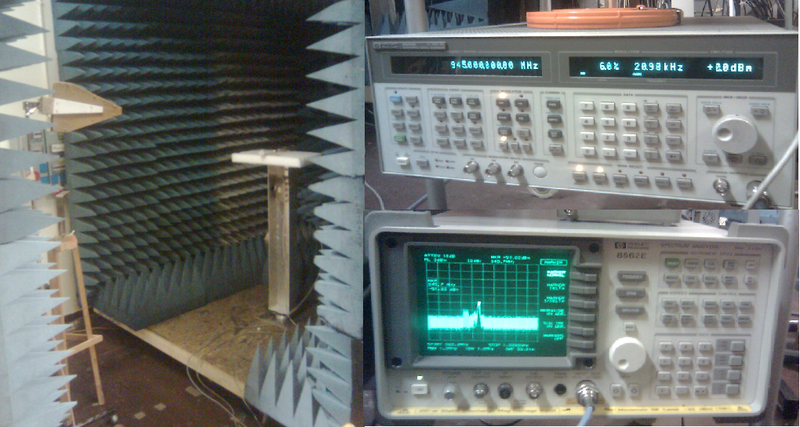 The picture on the left shows the radiation pattern testing of the small 915 MHz antenna. The antenna is generating a signal with the frequency of 945 MHz which results in a received signal as can be seen on the spectrum analyzer. The picture on the right shows CHAD with some of the cameras already mounted. In the meantime the team members at KTH are working hard to assemble and test the entire electronics in order to ship them to Glasgow next week Monday. After that the final assembly and testing will be carried out in Glasgow.